TOCWOC’s Take: Thomas Henry Carter was a member of a prominent FFV, and he ran comfortably in the highest circles. Carter had everything to lose if the Confederacy lost. He ended up as one of the best artillerymen in the Army of Northern Virginia, and this set of more than 100 letters to his wife Susan contains some very frank observations about some of the most well-known Confederate generals. I’m about a third of the way through the book as I type this, and it is an incredible primary source for those interested in Civil War artillery or the Army of Northern Virginia. Drew Wagenhoffer already has his usual thorough review up on this one. I think it’s safe to say you won’t see many more primary accounts from the highest ranks of the ANV which are this detailed. 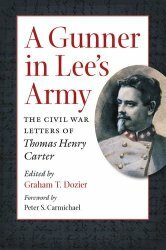 As the publisher’s blurb at UNC Press notes, Carter offers particularly good accounts of Antietam, Spotsylvania, and the 1864 Valley Campaign. This looks like another solid entry in the Civil War America series by UNC Press. TOCWOC’s Take: I complain a lot, here and elsewhere online, about the proliferation of Gettysburg books at the expense of everything else. That said, here’s an extremely rare instance of the right guy writing a book length study of an event that truly deserves one. 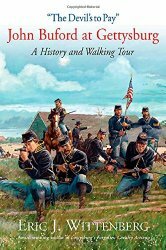 Eric Wittenberg has a plethora of excellent books on the Civil War to his credit, something like 17 at this point, and this one looks to be one of his very best based on what I’ve gleaned from the book itself and the reviews pouring in. The Union was incredibly lucky on the morning of July 1, 1863. They had arguably the best cavalryman in the country in the right place at the right time to perform mission which might have significantly changed the outcome of the Battle of Gettysburg in the Union’s favor. This book mainly covers John Buford’s delaying action with a single division of cavalry on July 1, 1863, his feint of a cavalry charge on the evening of July 1, and some other minor action. Buford’s Division left the battle on July 2, headed in the direction of Winchester. Combine Wittenberg’s narrative with the usual Savas Beatie maps, and the added bonus of Jenny Goellnitz’s photos enhancing the guided walking tour, and you have a winner all around. Eric seems to be pleased with the results so far. TOCWOC’s Take: I am admittedly not a student of Reconstruction, at least not to this point in my life. My interest in the Civil War lies primarily in the realm of military history. So in this case, I’m not in a position to offer you an expert take on how this book differs from other Reconstruction overviews of the past. 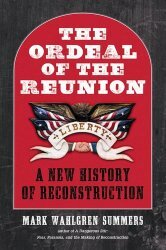 The author himself highly recommends Eric Foner’s Reconstruction as the definitive study of the time period. Summers positions his book as coming from a different viewpoint from most Reconstruction studies. Typically, writes the author, books on Reconstruction view Reconstruction as a beginning. Summers, writing a book in the “Civil War era” series, comes at the topic as an end to the events of the Civil War. All of this said, based on the heft of the book, the massive bibliography, use of primary source material and the fact that UNC Press is publishing this one, I suspect Summers’ book may be mentioned in the same breath as Foner when all is said and done. 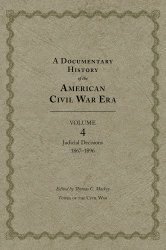 TOCWOC’s Take: Speaking of heft, the fourth and final volume in Thomas C. Mackey’s monumental “Documentary History of the American Civil War” from University of Tennessee Press continues that series into the Reconstruction era and beyond.Volume 1 concentrated on “Legislative Achievements,” Volume 2 on “Political Arguments,” and Volumes 3 and 4 cover “Judicial Decisions.” Taken together, this series is sure to be a go to reference work for generations to come. Admittedly, this series is aimed at public and college libraries more than at individuals, but the price ($53 at Amazon at the time this is written) is actually fairly reasonable given the massive amount of material contained within each volume.